The dynamics of a compressed air system frequently plays havoc with the operation of the air compressors in the system. Unless you understand the system issues which impact the compressor controls once they are applied to a system, the controls can actually work against any attempt to improve the efficiency and reduce the operating costs of your compressed air system. In this article, we will discuss the cause of these problems, how best to address them immediately without significant investment, and then how to plan for even greater efficiency with future modifications of the system. First, we need to understand how the controls on the compressor are designed to function. Individual compressor controls are intended to manage the output of the compressor in terms of volume based on pressure feedback and to provide safe operation while minimizing the risk of damage to the compressor. When the compressor capacity exceeds the demand, the pressure rises and vice versa, so the controls are designed to respond to these changes in pressure within preset limits. In most systems then, it is necessary to have more compressor capacity operating than is actually required by the system at its peak demand level including short term requirements created by intermittent users. This is simply because the system pressure will fall if the compressor capacity is less than the requirement and precisely matching the system’s demand for air only occurs momentarily if ever in all systems managed by the compressor controls. Therefore, since peak demands are intermittent, managing the output of the compressors really means limiting their performance most of the time in order to maintain a desired pressure level. Compressor controls accomplish this with a variety of methods depending upon the manufacturer and the type of compressor but the most common control methods are inlet modulation, variable displacement controls, and load / unload control. The Compressed Air Challenge has published materials that discuss these control types in detail but for our purposes it is important to recognize that in general limiting the performance of the compressors creates inherent inefficiency that has to be considered in any control scheme if the system’s efficiency is to be improved. Because compressor controls are designed to adjust compressor flow based on changes in pressure so the point at which each compressor monitors pressure becomes critical to understanding the response and performance of the each compressor in the system. Through the years, each compressor manufacturer has located the signal line of their compressors in different locations on the machine for a variety of reasons. With reciprocating compressors for instance, the signal is typically connected to the system at a receiver downstream of the aftercooler in order to minimize the impact of the pressure pulsations created by this type of compressor. . On centrifugal compressors, the signal is generally connected much closer to the compressor so that the controls can detect and protect it from surge conditions which are potentially destructive to the compressor. Rotary screw compressors, however, are the least consistent in terms of signal location. Rotary screws can have the signal on the sump, after the separator, after the minimum pressure valve, or after the aftercooler. The signal is located on the compressor as part of the package and will prevent over pressuring the machine or over powering the motor. 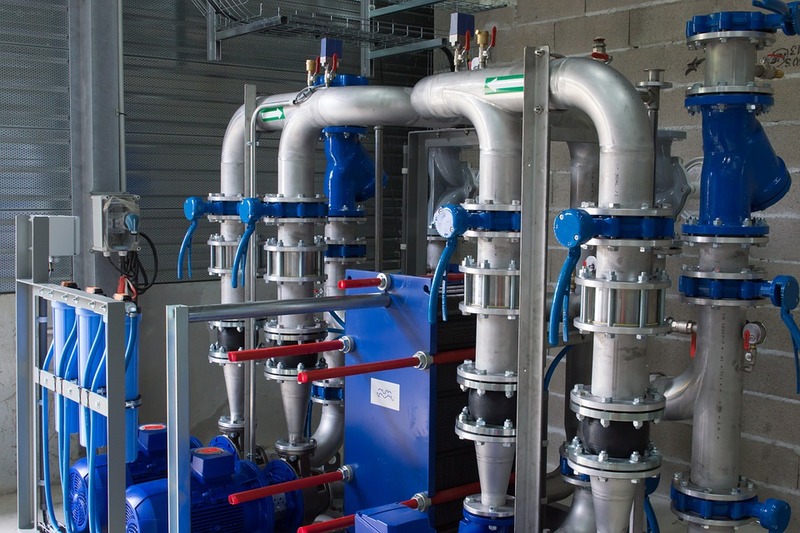 The concern is that if the signal is connected downstream of a blocking valve which were accidentally closed, the compressor controls could respond to a lower system pressure and the compressor would essentially dead-head against the valve causing high internal pressures and high amp draw. Certainly, safety relief valves and other safety mechanisms are in place to minimize the risk and damage but this is obviously an undesirable condition. Lets consider why these signal locations may not be optimal from a systems point of view and how the variety of locations complicates the process of optimizing efficiency. Consider for a moment a rotary screw compressor with a closed blocking valve. When this compressor loads, the pressure internal to the compressor will rise and the package mounted signal location will unload or modulate the machine but since it cannot deliver air to the system, the compressor will not have any impact on the system pressure. If we were to begin to open the blocking valve, the pressure in the compressor sump would attempt to equalize with the lower system pressure. As this occurred, the pressure drop across the valve would slowly dissipate allowing the controls to “see” the system pressure more and more accurately and to respond appropriately. Obviously, the pressure drop across the valve distorted the controls view of system pressure and the higher the pressure drop, the worse the distortion. While we can open the valve and eliminate this problem, all pressure drop in a system causes this same problem. The variety of signal locations discussed above can create a designed in 3-7 psi misinterpretation of the system pressure but more importantly, each compressor in a system would interpret a common system pressure differently. This is depicted in Diagram A. Note that Compressor #1 has a signal location on the sump after the separator but before the aftercooler which is shown as air-cooled. With the same 110 psig discharge pressure as compressor #2, the signal for compressor #1 reads 115 psig because of the pressure differential across the aftercooler. In reality these two compressors are going to reach the unload pressure at virtually the same discharge pressure even though the control bands are set in a reasonable cascade. This is the reason that it is difficult to get multiple compressors to work together in a system and a system with multiple compressors in multiple locations compounds the problem. Additionally, in our example, the pressure drop across the dryers and filters in the system is identical but if they are different, and they normally are, the problems are again compounded. Another major issue that is often overlooked is the impact of this pressure drop on the control band of the compressors. For example, most rotary screw compressors have an adjustable control range which is typically preset at 10 psi between the load and unload points. Examine compressor #2 in Diagram Aabove. The pressure drop from the signal location to the plant header is 6 psi across the dryer and filter. Because this compressor’s setpoint puts in the trim position running load / no load, the effective control band is approximately 4 psi in this system. Here’s why. When the compressor reaches its unload setpoint of 110 psig at the signal it unloads. Since there is no flow from the compressor at this point, the 6 psi pressure drop immediately disappears and the pressure at the compressor signal location will equalize with the system which is 104 psig. However, when the pressure drops to the load setpoint of 100 psig, the flow from the compressor re-establishes the 6 psi differential and the pressure at the signal immediately jumps to 106 psi while the system pressure is still at 100 psig. When the header rises 4 more psi, the pressure at the signal reaches the unload setpoint of 110 psig and the compressor unloads again. So, there is an effective pressure range of 4 psi while depressurizing (104-100 psig) and an effective pressure range of 4 psi while pressurizing (106-110 psig). The speed at which this cycling will occur can be predicted by comparing the compressor capacity to the storage in the system but it is sufficient to understand that this erosion of control band is a major contributor to rapid cycling in air compressors which causes inefficiency, lubricant carry over, and reduced airend life. In the circumstances described above, the most common solution is to put the compressors into modulation control mode. Modulation would allow each compressor to be partially loaded and from a practical standpoint the control bands only determine the pressure at which the compressors reach full load. However, the efficiency of the system will be negatively impacted because modulation inhibits the efficiency of rotary screw compressors significantly. As depicted in the graphs in Diagram B, the capacity or flow capability in scfm drops off much faster than the power expressed as kW. For example, at 40% of the rated flow capability, the compressor still requires >80% of the full rated power. An even more costly factor is that in full modulation control, the compressor never unloads and is therefore not turned off except by manual intervention. This results in more compressors running modulated than required and as the demand for air drops, the compressors become more and more inefficient. Without unload and sump depressurization occurring, it is very difficult to determine just how much capacity is being delivered to the system. The control bands can be set in a normal cascade with confidence that the compressor will react in a predictable manner. Fouling heat exchangers, filters or dryers will not change the way the compressors relate to any given header pressure which means the compressors will all work in concert to support production. The pressure differentials will not erode the control band of the compressor. The downstream signal is more likely to remain clean and dry because the air it is monitoring has been through the filters and dryers. The compressors should be setup by a knowledgeable, experienced compressor technician. The pressure in the sump and/or discharge and the amp or kW draw on the motor should be monitored while setting the controls to the downstream signal to confirm that the compressor is operating within its design parameters. Tag or lock the blocking valves between the compressor discharge and train the operators so the valves will not be shut with the compressor running or capable of running. Connect the downstream signal to the existing signal with a two position valve which allows either signal location to be utilized but does not allow both signal locations to be turned off at the same time. Install an extra pressure switch in series in the unload circuit with its signal on the sump of the compressor. Set this switch to unload the compressor at the rated pressure of the compressor at the sump or at the pressure which jeopardizes the motor. Consider installing a digital amp and pressure gauge for each compressor to provide accurate readings of the compressors operating condition. Use the pressure reading to monitor total pressure drop from the compressor discharge to the system. An automation system utilizing a Programmable Logic Controller can provide the same benefits as a common downstream signal but a properly designed and applied system will increase the efficiency even further. The typical automation system would control all the compressors based on a downstream signal but should make decisions about loading and unloading compressors based on the rate at which pressure is changing not just on upper and lower limits. In fact systems are available which actually react more or less quickly depending upon the rate of change at different pressures within the acceptable control band. In addition, automation should be able to rotate or sequence different compressors in a different manner so that running condition can be maintained or wear can be equalized as desired. This is particularly important in larger systems, in systems where the demand varies significantly, and/or in systems with different compressor technologies. For example, a larger system may have centrifugal compressors which should be used for base load and rotated on a weekly basis to maintain condition while using rotary screw or reciprocating compressors to accommodate the daily variations in demand more efficiently. Additionally, the use of pressure flow controllers in systems with variable demand for air can provide additional savings by allowing stored air to support intermittent peaks in demand while the compressors are managed to support the averaged demand provided by the increased useful storage. We do recommend working with an experienced systems designer to properly apply automation in most cases. The purpose of properly applying compressor controls is to minimize the compressor power at any point by more closely matching the operating supply capability to the demand. Knowledge of the issues which exist in coordinating the compressors to operate in concert with the system will allow the supply system to be as efficient as possible. The Compressed Air Challenge can provide related materials and more background on maximizing your compressed air system’s efficiency.